The DVD audio/video box set including Tubular Bells 2003 DVD-A, Tubular Bells II (Edinburgh Castle) DVD, Tubular Bells III (Horseguard’s Parade) DVD, and The Millennium Bell (Berlin) DVD will be released on Nov 17 and will cost £35. Update: Nov 24. Update: Jan 2004. I'm glad that it now seems official that the original TB demo tapes will be included, very much looking forward to hearing those. ¿¿Es una maldita broma?? ¿¿Se creen que somos estúpidos o es que nos toman por tontos?? ¿¿Cuándo van a parar de editar la misma porquería?? ¿¿Quieren vendernos siempre lo mismo, una y otra y otra vez?? Además, los montajes de los conciertos de TBII y TBIII son penosos, con sonidos en playback y sin editar el concierto entero, sin extras ni nada. Si vemos cualquier otro DVD de cualquier otro concierto de cualquier otro artista podemos encontrarnos con horas de extras, entrevistas, making off, especiales... Pero los editados sobre Mike son PENOSOS. ¡Ya esta bien de soportar tantas tomaduras de pelo! ¿Cuándo piensan editar material realmente interesante e inédito? Abajo las discográficas. Entre todos podemos acabar con ellas. Actually,it´s the only thing that most fans here want to hear. 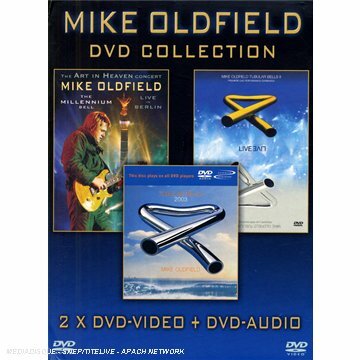 A Mike Oldfield DVD-Audio/Video box set is to be released by Warner Vision to mark the 30th Anniversary of ‘Tubular Bells’. The set, scheduled to hit the streets in the U.K. on 17th November, will include DVD-Video live performances of ‘Tubular Bells II’ from Edinburgh Castle, ‘Tubular Bells III’ from Horseguard’s Parade, London (originally released as a double-sided DVD-Video disc in 1999), and ‘Art In Heaven’, the concert staged in Berlin to mark the Millennium celebrations of 2000. Together with highlights from ‘The Millennium Bell’, the Berlin concert features an excerpt of ‘Tubular Bells’, ‘Portsmouth’, ‘Moonlight Shadow’ (an excellent performance by Maggie Reilly), ‘Secrets’ and ‘Shadow on the Wall’ (a version that pales next to the Roger Chapman original vocal). Also included as part of the package will be the soon-to-be-released DVD-Audio version of ‘Tubular Bells 2003’ – it boasts a 48kHz 24-bit MLP surround version of the album and excerpts from the original demo tapes, an element, albeit low-fidelity, likely to be highly prized by Oldfield fans. The entire package will retail for £34.99 in the U.K., which we’re told is a saving of nearly £21 if all the discs were purchased separately. Speaking of which, the U.K. release date for the stand-alone DVD-Audio disc of ‘Tubular Bells 2003’ has been delayed once again, it is now expected to become available on 3rd November. We suspect the U.S. release date to be similarly delayed. Mike Oldfield Live in Berlin (with Carrie Melbourne, bass and Chapman Stick). "...and excerpts from the original demo tapes". Only excerpts!!!!!!!!! Oh, Noooo!!!!!! Argggg!!! La gracia esta vez está en la maqueta de TB... ¿será verdad? Yo pienso que al final se echará atrás, o seguro que "le he añadido un bajo midi pq si no no cago a gusto, you know". Por lo demás, seguirá haciendo lo mismo pq somos gilipollas y le seguimos comprando estas pijotadas. Si no, ¿cuantos de nosotros faltamos a las 9 en punto de la mañana delante de nuestra tienda de discos para comprarnos el Timotubular 2003, en caja con dos discos que YA teníamos y con un DVD que vale una poca mierda? Pues eso, lo de siempre y poco más. Es triste que la máxima novedad sea que nos de su PRIMERA composición. Pq no le entra una depre de caballo, empieza a meterse el ídem, nos graba algo decente, luego se rehabilita, publica algo mejor, luego le da por hacer tours y nos visita tres veces al año y... no, mejor se queda en casa jugando a la Play... o al TR3S LUNAS. I can see our Spanish friends are getting upset by the f*****g merchandising we are seeing lately ! Yeah, "excerpts of the demo", so maybe in 6 months we can buy the full "remixed / remasterd / rerecorded / full / complete / essential / orginal demo of TB73, in full 5.1 / SACD / DVD-A / THX / Dolby-XP / MS-Paladium-Copy-Protected / P2P-Blocked / Bad-language-filtered / Go-to-hell-with-your-money". And now he is fooling around with his best worldwide market ! Peganle duro ! Que se de cuenta este cabron ! Que Viva Mexico !! Ain't he dull ? Or is he the slave of his editor ? just a quess..there will be a 5.1 collection of tubular bells 2003 and ommadawn next year..you can't look this any other way than that mike is in need of money..
Mmmm.... yes, I guess so. But how could he have spent so much money? I mean, he didn't do any serious things other than producing those MVR games... and that isn't a lot of money compard to what Mike has on his bankaccount. He also was in need of money back in 1980 when he got back from touring the Exposed tour. He didn't release any compilations then, only made Platinum which gained him more money again. So why won't he just make a new album for more money? I think Warner Spain is behind this. But oke, Mike's bank account is not my business. I doubt very much that Mike is anywhere near being bankrupt, but that said I'm sure he would like a bit of easy money and this DVD box set, and Ommadawn 5.1 for that matter, are both easy money. Why oh why oh why he couldn't have got his arse together and put anything interesting in that DVD box set is anybody's guess. I don't know why he or WEA are so stupid, on one hand he could have included some interesting new live footage and sold bucket loads of the box set to us fans, but instead there's nothing new and who exactly is going to go out and buy it? Not many people, except a handfull of poor 'completest' fans who will want it for their collection. Why isn't any imagination put into releases like this for the mutual benefit of us all? I agree that it is too much of all these Box set relaeses, with stuff all fans allready have. Why don't he/they release some of he's old stuff like The Essential "Live at Knebwoth" or Wind Chimes and stuff like that on DVD. That I think he could make a lot more money off, and make he's fans much more happy. Yeah, "excerpts of the demo", so maybe in 6 months we can buy the full "remixed / remasterd / rerecorded / full / complete / essential / orginal demo of TB73, in full 5.1 / SACD / DVD-A / THX / Dolby-XP / MS-Paladium-Copy-Protected / P2P-Blocked / Bad-language-filtered / Go-to-hell-with-your-money". Oh man. I wish I could have said it this way! I want these demo's but if I buy this album it will be the 14th with complete or incomplete pieces of TB1. It has to stop! Most irritating to me is rather cynical timing of the TB2003 DVD-A release - to me it looks very much like it was delayed deliberately so that fans end up buying the album twice (had it been available in May, some fans may have just chosen to buy the DVD-A, but of course even if they only really wanted it on that format, they had to buy it on CD if they wanted to hear the album before November...well, that's unless they found some other way of hearing it...). I think The Essential Mike Oldfield might have the potential to sell just about as well as some of the currently available videos (I'd think it could be at least as popular as the Berlin one), but at the moment it seems to be only Warner who are interested in releasing Mike's material on DVD, and being from Mike's Virgin era, The Essential holds little attraction for them. Yes, it is sad to see another missed opportunity. I myself would love to see any one of quite a few Mike videos: live ones or even those dodgy music videos. Instead of those four, how about: Wind Chimes Video, Elements Video, Exposed live Video and Knebworth live Video in a boxed set. I'd buy that, as would most people here I'm sure. There are heaps of MO things I would buy if they would only be bothered to make them. How about one of those Classic Album DVDs for Tubular Bells? They really can be quite interesting. They could interview everyone and include those demo tapes there. I'd buy that, even if it was a bell thing. Those sorts of things do sell as well: the Classic Albums: Dark Side of the Moon is I think the number 3 selling DVD in the big DVD shop in the city, so there is a market for them. About DVD audios, I really don't see the point to them. I got Magnification by Yes on DVD-A, and it's just annoying me that I can't listen to it on my regular CD players or in the car. OK, the bonus live video and short interview are nice, but I'd prefer to be able to listen to the songs in my room or in the car. I don't really care if the DVD-A has five percent better sound quality, I'm used to the dodgy speakers in my room. All of the "easy money" talk is a little silly. If Mike was in need of cash, why would he do a 5.1 mix of Ommadawn? Because it's guaranteed to sell 5 million copies? I don't think so. Sure there are many other things (new album, older concert videos) that would make more desirable releases for the fans, but we're back to the usual rule of thumb: Only buy what you like and want to buy. The Tangerine Dream principle. it’s good we’ll have the original demos but i have to say it’s the first time in long long years that i’m not looking forward a release of him... already too many bells. it’s now more than a year we started talking about the re recording, isn’t it? and the bells go on moving... it’s becoming boring if u ask me.